April showers bring May flowers. In quilting/sewing terms, hard work and perfecting techniques create beautiful projects. To celebrate your accomplishments, we will be offering 15% Off all backing fabric (at least 3 yards) and 15% Off all batting for the entire month of April. You must bring in your completed top to qualify for the discount. Thank you all for the wonderful birthday wishes. I am truly very blessed to have all of you in my life! I cannot tell you how much I appreciate the cards, flowers, special gifts, and friendship star blocks that you all showered on me. My birthday was certainly one for the history books and I cannot wait to finish up the quilts for our veterans. I know that many of you will be attending the Bitterroot Quilt Guild's spring retreat in Seeley Lake in two weeks. Come in and get your supplies early so you will be well prepared. Remember, measure twice, cut ONCE. We set up a new section of the quilt shop specific to Montana outdoors. It showcases everything outdoors; from snow skiing patterns and wildlife fabric, to Yellowstone and Glacier National Park patterns, kits, and fabric. Be sure to check it out the next time you’re at Patches. We have more coming in all the time. 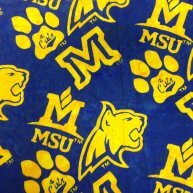 Montana State University bobcat fabric (batik) recently came in and is going fast. Old Faithful Geyser patterns are hot off the press too. Lots of new wildlife, Montana, Glacier National Park, and Yellowstone National Park fabric blocks complement our already large selection; all of which have been reduced in price by as much as 20%. New fabric has been coming in weekly, such as dozens of new Island batiks, the Flip Flop Island collection and the Just Desserts collection from Exclusively Quilters. Tomorrow (Tuesday, April 5th) is National Pillow Fight Day. To celebrate this fun event, we are offering all pillow inserts at 20% OFF. Stop in and let the feathers fly! This Friday (8th) is our monthly Pajama Party. Then, on Saturday Laurie Dunbar is teaching the Know Your Serger class. We have a few more seats left for this terrific class, so call us to reserve yours. Mark your calendars, because the following Saturday (April 16th) is Wear Your Pajamas to Work Day. The bad news is that ALL of our staff will be wearing pajamas that day. The good news is, John won’t be wearing anything! Also, to celebrate this fun event, we will be having an Early Bird Clearance Fabric Sale. From 7:00 am to 8:00 am Clearance Fabric will be $5.00/yard. From 8:00 am to 9:00 am it will be $6.00 per yard. And, from 9:00 am to 10:00 am it will be $7.00/yard. I hope to see you and your projects soon!